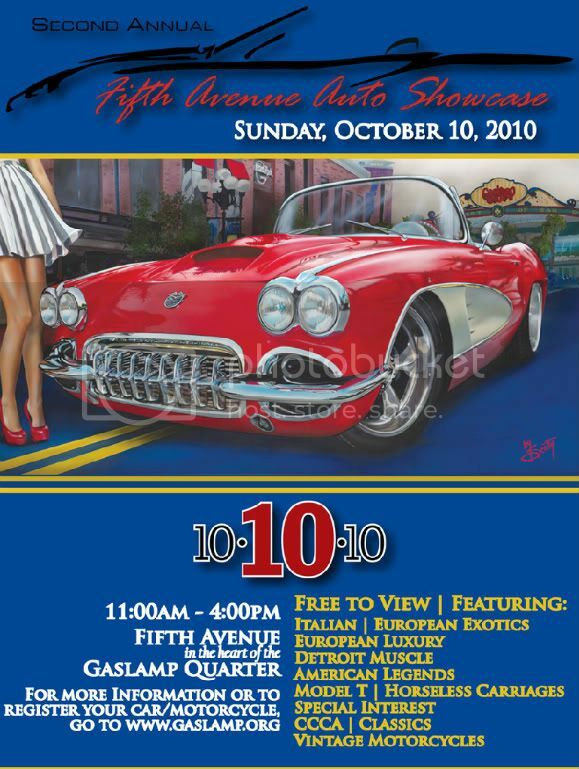 Here's some added info from the event... "Whether you are an avid car enthusiast or a casual admirer, you are invited to join us for the Second Annual Fifth Avenue Auto Showcase, rolling into the Gaslamp Quarter on Sunday, October 10, 2010 from 11:00am to 4:00pm. Last year’s event was a huge success, with over 10,000 guests taking in Italian Exotics, Detroit Muscle, American Legends and Special Interest cars spectacularly displayed along Fifth Avenue, set against the dramatic backdrop of the district’s Victorian architecture. This year’s exciting event will be even bigger and better, featuring over 120 cars, with the addition of everything from European Luxury to Vintage Motorcycles to the iconic Woodies of California’s beach culture heyday." For more info, check out http://www.gaslamp.org/ or click here.